Story: I am a Maharashtrian.. so I often end up surfing on a number of Marathi websites.. One of the websites I used to be active on is manogat.com. A while ago I found really great recipes on Manogat especially for typical Maharashtrian/Marathi items. This one is by far the best catch! Me, my hubby and my FIL simply LOVE eating fish.. baked, grilled, deep fried, soaked in a really spicy Konkani curry, raw or pickled in a sushi.. In my family - if it's fish it's good! For my veggie friends - I would highly recommend half fried potatoe or cauliflower pieces intead of the fish. That's how I serve this gravy to my MIL and my veggie friends.. Source: Posted by Prabhakar Pethkar on manogat.com in 2005 This post is a slighlty modified translation of the recipe. 10-12 Sichuan peppercorns or Tirfale : It has a strong flavor so I use only 4-5. The flavor is great - but don't sweat it if you don't have it. Rub salt, 1 tbsp lemon juice and turmeric powder on the fish fillet and keep it aside. Dry red chillies, coconut, ginger, garlic, onion, tomatoe, kasoori methi, tamarind pulp, Garam masala powder, coriander leaves. Heat Oil in a large Kadhaaii. 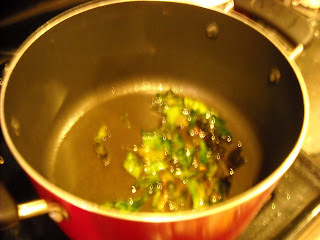 Add curry leaves and sichuan peppercorns to the oil. the curry leaves splutter and you can smell the aroma all over the kitchen.. At this point - add the masala paste to the oil. Here's the time-consuming part - you have to stir this paste on slow-medium heat for a long-long time - something like 30-40 minutes. But - 'Intazaar ka Fal Badaa Tasty Hota Hai!'. Resist the temptation of increasing the heat.. Trust me - it is all worth it! As you start heating/stirfrying the paste - it soaks the oil at first..
After a few minutes (10-15) it will start to shine a little.. Towards the end (after 30 ish minutes of shallow frying) the paste is cooked and oil starts separating from it. Add water to make a semi-thick gravy. Turn up the heat, cover the kadhaii and bring to a boil. Cut the fish fillets into 1.5 inch squares. When the curry is boiling, turn the heat medium. Add fish or potatoe or cauliflower..
Cover for about 3-4 minutes to cook the fish. The fish curry is ready!! How come your veggie friend has never eaten this?? That is great to have your recepie and try it. Curry is the best zest for the dishes.